​Mankind is not alone in living in organized communities. The most common of the social insects, the ant, also exhibits these behaviors. Ants do not have the power of reason. They live in blind obedience to instinct, neither choosing nor willing to do anything. Ants occur throughout the world. 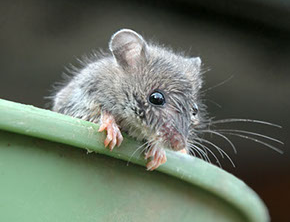 They make their nests in many materials, including soil, sand, wood, and leaves. 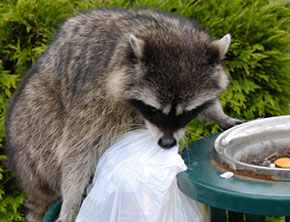 There are at least 8000 species, and possibly as many as 14,000. 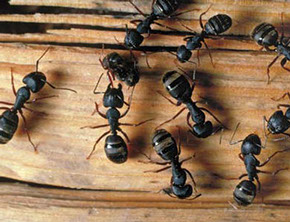 Carpenter ants usually live in a moist, damp wood, they do not eat the wood, they gnaw at it to expand their nests. Their bodies, like those of all insects, are divided into three sections: the head, the thorax, and the abdomen. Most ants live from 6 to 10 weeks, although certain queens may live for as long as 15 years, and some workers for up to 7 years. 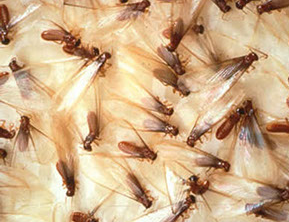 First we will inspect your home for any signs of a nesting area for ants, as well as damage caused by termites, powder post beetles or any signs of a rodent or bee problem. If a nesting area has been discovered/found we will treat it accordingly. In addition, we may apply products to the baseboard areas in all the rooms as well as treating around any points of access, doors, windows etc. Additionally, we will apply products and treat the outside perimeter and apply a residual product under the shingles/siding to prevent ants or other crawling insects from entering through this area. People and pets should not come in contact with the products until the treated area is dry. We advise vacating the home for 2-4 hours following. If anyone is pregnant, or has a heart or respiratory problem it is advisable for them to leave the premises during the drying time. You should see an immediate reduction in the number of ants sighted. You MUST give the products 21 days to become fully effective. After 21 days if you are still having a problem please do not hesitate to contact us. During this twenty-one day period if you are seeing ants try to observe where they are coming from or going to. If you are hearing a crunching noise or seeing piles of sawdust appear please call us immediately.